Library Wish List from Ms. Lumb - Welcome to TMSA's PVO Parent Connect! Our library needs more books!! Ms. Lumb has a wish list for our library. Attached below is the books that are wished for. If you are willing to donate toward this list, please take a look. 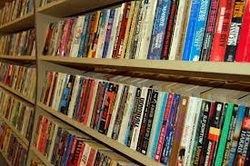 Used books in good condition that you would like to donate from your home are welcome as well. Please contact Ms. Lumb for any additional information.